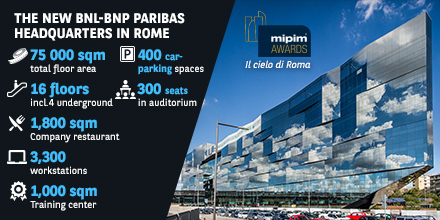 The building, developed by BNP Paribas Real Estate near Camillo Benso Conte di Cavour station, will house up to 3,300 workstations. The new building developed by BNP Paribas Real Estate, future headquarters of BNL-BNP Paribas Group, has been selected as a finalist at the 2017 MIPIM Awards. Following a careful analysis of hundreds of projects from around the world, the international jury comprising nine real estate sector professionals included the new building in the list of the four finalists vying for international recognition for the “Best Office and Business Development” category. The name of the winning project will be announced during the property event to be held in Cannes from 14 to 17 March. In accordance with the competition rules, the winner will be determined by combining the vote of the international jury with those of MIPIM participants, each representing 50% of the final result. The MIPIM Awards ceremony will be held at the Palais des Festival on 16 March at 6.30 pm. With a floor area of 75,000 sq m, 12 storeys and four underground levels, the building developed by BNP Paribas Real Estate and designed by architects 5+1AA, has an original and innovative design that integrates it into the surrounding urban environment, giving the area a modernity that the new Camillo Benso Conte di Cavour high-speed station, designed by architects ABDR Architetti Associati, had already started to develop. The building will house up to 3,300 workstations, as well as a training centre, an auditorium, a company restaurant, a garage, a terrace offering panoramic views, a gym and a nursery, making it a comfortable place to work according to the modern principles of company welfare. The project is also marked by the building’s high level of environmental sustainability, which will be see it certified as class A and LEED Gold, with reduced energy consumption compared with a traditional building. In July 2016, the building received another important recognition, “The Plan 2016” award, as the best property development for office use. The international jury - comprising architects Mario Cucinella, Kim Nielsen, Boris Podrecca, Raymund Ryan, Bernard Tschiumi and Li Xiangning - announced the building as the winner following a careful valuation of 500 projects from all over the world.